Join my family and me as we start out 2017 Whole30-style! 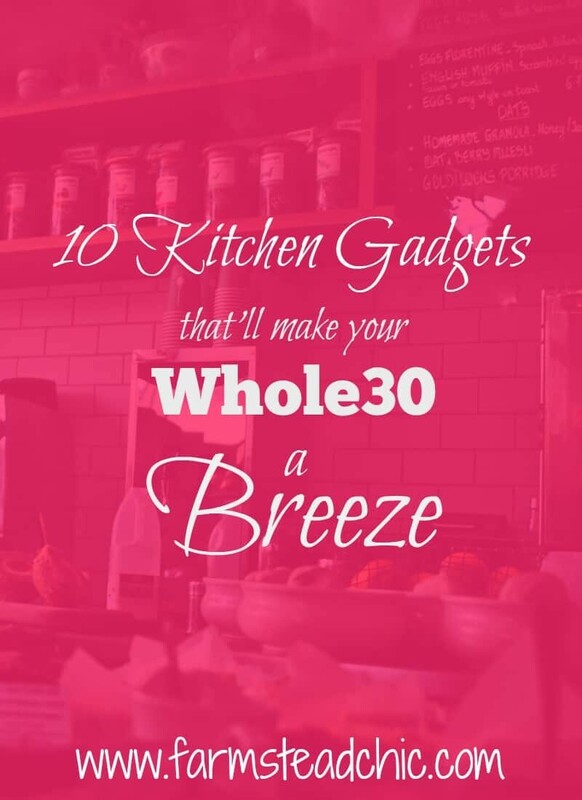 These are my favorite, can’t-live-without, very best kitchen gadgets that will make your Whole30 a breeze! Whether you’re prepping for your very first Whole30 or a seasoned veteran, these ten items are must-have to make your journey a breeze! I try to always use fresh garlic instead of garlic powder unless I’m really in a pinch for time. This garlic press makes it super quick and easy to enjoy the irreplaceable flavor of freshly minced garlic but without a big mess to clean up. You don’t even have to peel the cloves! Just pop it in and squeeze. It also comes with a garlic peeler in case you need whole or sliced cloves instead. I use my Pampered Chef Mix ‘n’ Chop nearly every day. It is one of the best kitchen gadgets and keeps ground meat finely minced instead of turning into clumps when you brown it. It’s also handy for mashing potatoes, plantains and boiled eggs. It’s made of nylon, a heat-resistant, BPA-free plastic, so it won’t damage your coated pans either. I always have lemons and limes on hand. They’re great for seasoning chicken, adding flavor to salads and taco bowls and giving sparkling water a little kick. When I’m only juicing one or two, I use a handheld citrus juicer because it’s super-easy to get the juice out, and there’s virtually no cleanup. You just peel off the skin and toss the juicer in the dishwasher. I use a mandoline slicer when I want whole, thin slices of onions, tomatoes, eggplant and other veggies that won’t fit in my food processor whole or when I just don’t feel like washing all of those pieces. It’s great for slicing up fresh vegetables for veggie trays or salads. You can also use it to make homemade potato chips and sweet potato fries. It comes with a safety guard so you won’t cut your hands, but I usually wear these cut-resistant gloves just to be safe. I love my spiralizer! You can serve countless dishes over zoodles! I have mine with leftover chili, sloppy joe filling, spaghetti meat sauce and pineapple salsa chicken, just to name a few. You can also make curly fries, chicken zoodle soup or a fancy side salad. I know what you’re thinking. Cheese is not Whole30-approved! Yes, yes, I know! But this cheese grater should be called “The Great Little Everything Grater!” It is another one of my best kitchen gadgets, and I use it to grate ginger for marinades and lemon and ginger-infused water. It’s also perfect for zesting citrus fruits to add a little (or a lotta) zing to your meals. An immersion blender excels when you are blending sauces and soups right on the stove. If you don’t want to deal with pouring small batches of blistering hot liquid into a traditional blender, this KitchenAid Immersion Blender is da bomb. It comes with a ton a attachments as well, which can turn it into a mini food chopper, a whisk and a baby food blender. There are some less expensive models available if you aren’t interested in all the bells and whistles. I use my KitchenAid food processor constantly. My favorite things to do with it are to shred cooked chicken (it literally takes seconds to perfectly shred two cups of chicken) for soups, dips and casseroles and make Whole30-compliant mayonnaise. The mayonnaise takes a little longer, but it’s totally worth it. This Lodge cast iron Dutch oven is my favorite piece of cookware because it’s the most versatile piece in my kitchen. I can make double batches of all my favorite soups, stews and chilis, or I can brown chicken or pot roast on the stove and then stick it in the oven to slow cook. I received it as a gift from my parents, and I can’t imagine completing a Whole30 without it! Yes! This has to be my favorite small appliance. When I first bought my NutriBullet, I thought I would just use it for smoothies. It blends so much better than the traditional blender I had. It will pulverize everything from frozen fruit to spinach and kale to nuts, seeds and ice in just a few seconds. However, it’s also great for making Whole30 marinades and small batches of creamy soups as well. The possibilities are truly endless. That’s it, folks. 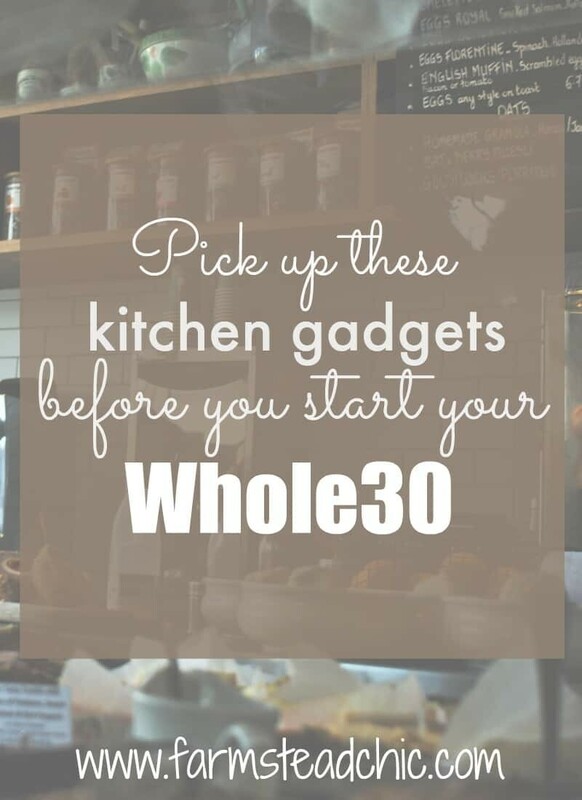 Those are the ten best kitchen gadgets (and small appliances) that I love the most and that will make your Whole30 a breeze. With these handle little kitchen tools, your choices for fresh, healthy meals will be endless!